I just received a Gmail update. 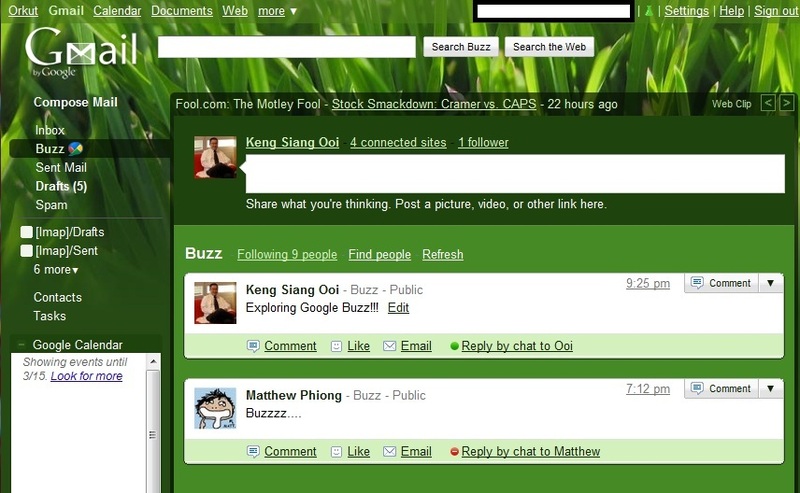 Google Buzz is there in my account! I finally can get a taste of the Buzz. Well, basically there are nobody in my buzz exp one of my friend Matthew who just got his buzz today. The first feeling I got from buzz was… another Twitter! Buzz allow me to post status update, follow others updates, let others follow my updates (follower) and etc. It also have a long list of following friend’s status update. (See the screenshot bellow) Aren’t it really look like a Twitter? Well, the different might be I can share picture, video and more other thing in there (now sound like Facebook’s wall post). Oh ya, there is no number of character limitation in buzz. Unlike twitter or facebook, buzz automatic follow other that they think user might interested when user just got their buzz account, I think it is according to the contact book in gmail. Sound scary huh? What happen if buzz automatically let your boss follow your buzz? I want to said I don’t feel anything special about Google Buzz. Well, it might something for those who own a gmail account but without a twitter account. For me, all my updates and following updates are in Twitter. I don’t want another similar social networking tool. I don’t really want to update my Twitter and Buzz every time (double work). Maybe a simple plug-in that allow my twitter status to be duplicated to buzz will be more better. (just like Facebook). Temporary there aren’t exist any plug-in for that, so I might just left buzz there until I found something interesting that buzz offer.